“The gyrfalcon’s whole life revolves around the ptarmigan,” ornithologist Ólafur Nielsen tells me as I sit in the back of his pickup truck. We’re navigating a trail through spiky black lava in the northeast on the longest day of the year. At his side is his son and namesake, Ólafur Nielsen Junior, known as Óli to distinguish him from his father. He’s been accompanying his father on his falcon trips since he was 10 years old and can’t imagine a summer without them. In order to get to follow the father-son duo on their trip for a day, I had to apply for a special permit from the Environment Agency of Iceland, months in advance. The purpose of our trip is to visit two or three gyrfalcon nests to mark and measure the nestlings. Even approaching gyrfalcon nests in Iceland is illegal and only a few researchers and scientists are exempted. Ólafur is one of Iceland’s most notable falcon scholars. “I’ve always been interested in birds. As a teenager, I became enamoured with the gyrfalcon and decided to make ornithology my life’s work,” Ólafur tells me. 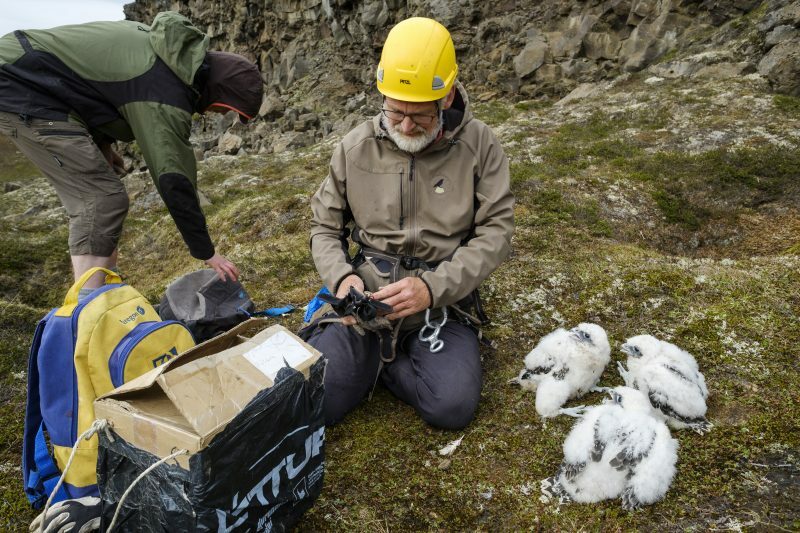 In 1994, after studying the gyrfalcon and the ptarmigan at the University of Iceland and Cornell in the US, Ólafur started working with the Icelandic Institute of Natural History, monitoring ptarmigan numbers, and has been studying them ever since. Ólafur’s research area in the northeast is around 5 300km2 and has 84 falcon nests, although the number of falcons varies. Earlier this year Ólafur visited the area to check how many nests were inhabited. This is the second visit of the summer and it’s a time-consuming one. Ólafur parks the jeep in a small valley between two hills. He and his son grab the equipment and we take off. After about 20 minutes’ walk over the hills, we reach a 20m high cliff and immediately hear the shrill call of the gyrfalcon. “She sees us right away,” says Ólafur as we see a falcon zoom towards us. She wants to scare us away. The Ólafurs get to work. Óli attaches a line to the cliff and Ólafur is lowered towards the nest. He takes the nestlings one by one out of the nest and slowly sends the flightless birds to his son in a cardboard box. The birds lie still on the grass at the bottom off the cliff and stare at their surroundings. 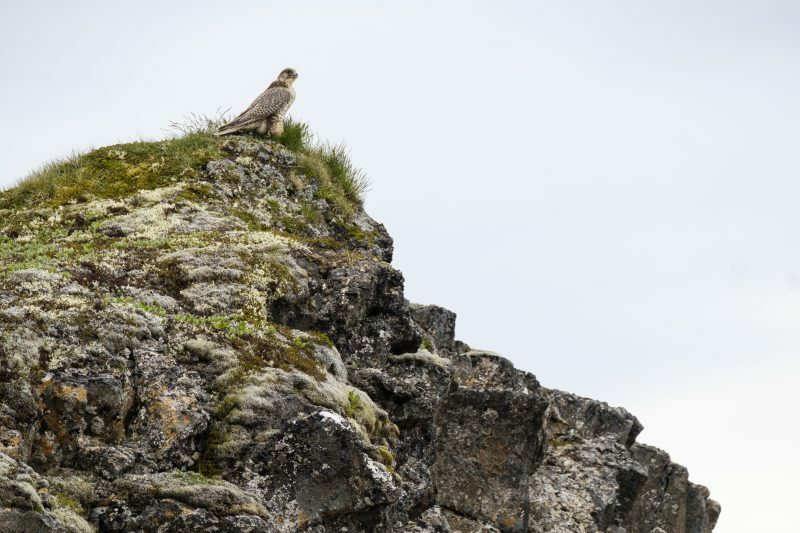 For 38 years, Ólafur has been visiting the gyrfalcons’ territory, marking the birds. “I’ve marked more than a thousand gyrfalcon chicks. We want to follow the birds’ travels, estimate their life expectancy, and learn where they nest. When I was studying, I spent three months a year monitoring them but now it’s about 4-5 weeks every summer.” Two metal rings with clearly visible letters are put around the ankles of each bird, they’re weighed, and their feathers and bones measured. Everything is meticulously documented. 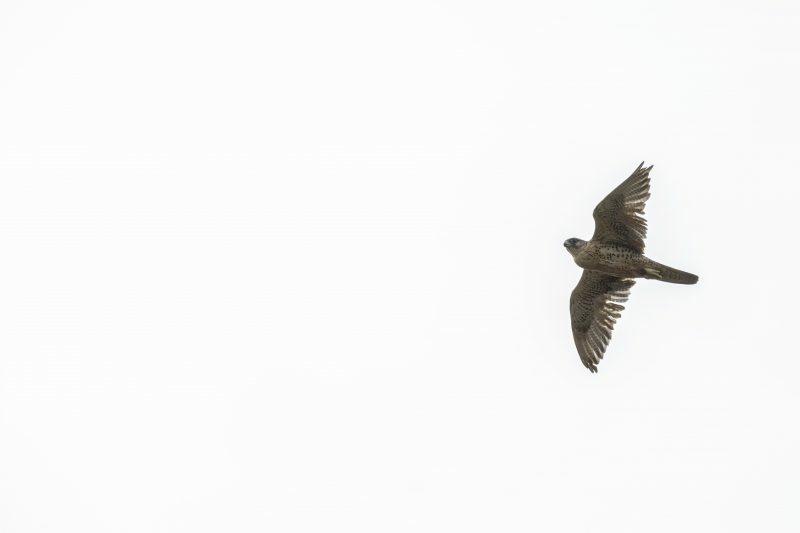 Finally, Ólafur goes down the cliff again, returning the baby gyrfalcons to their nest. A research project like this isn’t finished in the course of one summer. The number of birds within species varies wildly between years and for the gyrfalcons to flourish, the ptarmigan numbers have to be up as well. These two species of birds are completely intertwined so researching gyrfalcons is impossible without researching ptarmigans and vice versa. For Ólafur’s research to be definitive, he needs to devote his whole academic career to this one project. “I studied the ptarmigan and the gyrfalcon for six years in university but that’s nowhere near enough time. The numbers of birds within the species rises and falls over the course of 10-12 years and for definitive results, you need to monitor at least three of these cycles,” Ólafur tells me. His studies had just begun when he left school, in fact, he’s still working on his graduating research. 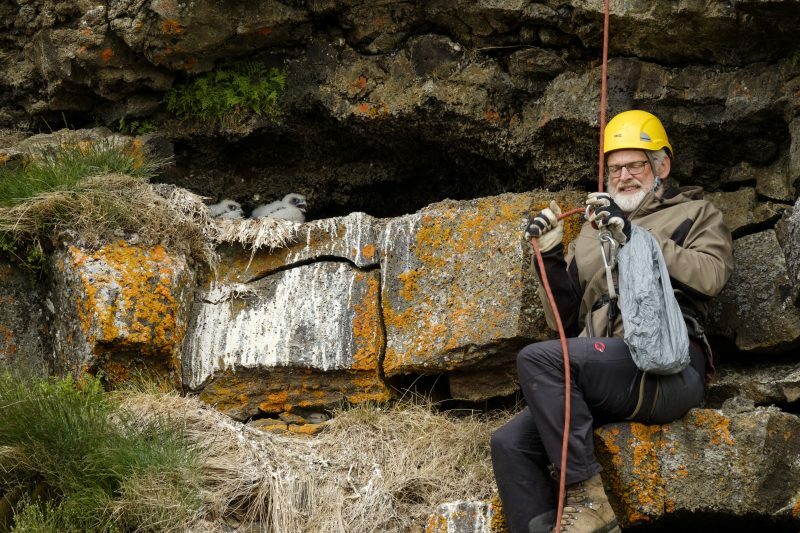 When asked if how he conducts his research isn’t dangerous, Ólafur admits that gathering information up and down rocky cliffs certainly has its perils. “I once fell and almost killed myself, as a teenager. After that, I learned to use lines and get lowered down to the nests instead of climbing. We try to be as safe as possible and I’m never alone.” Ólafur clears leftover food from the nest to see what the falcons have been eating. It’s mostly ptarmigan bones. Despite having been researching nests like this for decades, Ólafur is genuinely interested in each new visit. “It’s an obsession of mine and I’ll keep doing this as long as my health and abilities will allow. It’s physically demanding but it gives my life fulfillment. It’s so much more than a job.” If the gyrfalcon’s life revolves around the ptarmigan, Ólafur’s life has come to revolve around both of them. As we leave, the nest is a little bit cleaner and the soon-to-be-grown gyrfalcons sport shiny metal rings around their legs. Otherwise, everything is the same as when we arrived. Ornithologist Ólafur Nielsen holds a gyrfalcon chick up to the camera.